June already! Father's Day is on the horizon. Perhaps your dad is a cool dude... well, so are most cats pretty cool, or at least they give the impression they think they are! 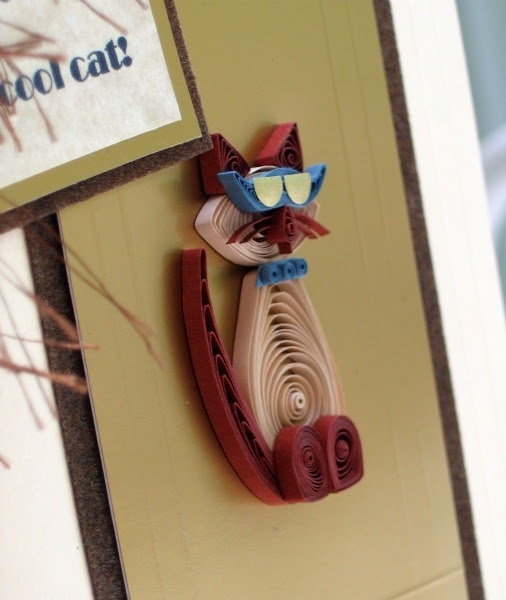 This quilled fellow, inspired by a rubber stamp I saw ages ago, is no exception. Dare I say the glowing, foxy sunglasses give him a bit of personality? Golden metallic paper and trimmed down punchees from a standard hole puncher do the deed. Russet brown eyelash yarn for the tag tie does a pretty convincing job of conveying the idea of fur - at least the kind that stands on end.... HISS!! Same goes for the soft and fuzzy suede background paper. I used the score blade on my paper cutter to make an embossed border on both the gold paper and cream card... quick to do, kind of manly, and I like the way the lines frame the cat. If you're new to quilling, check out the Tutorials tab located at the top of the page for lots of how-tos and tips. Questions? I'll be happy to help in the comments section. SOOOO cool. 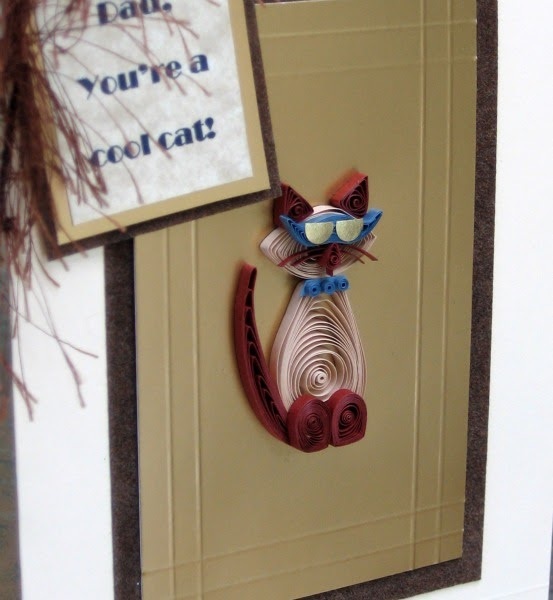 I also love the embossed border and the sunglasses such a nice idea. i love the sun glass . you are really an inspiration for beginners like me. 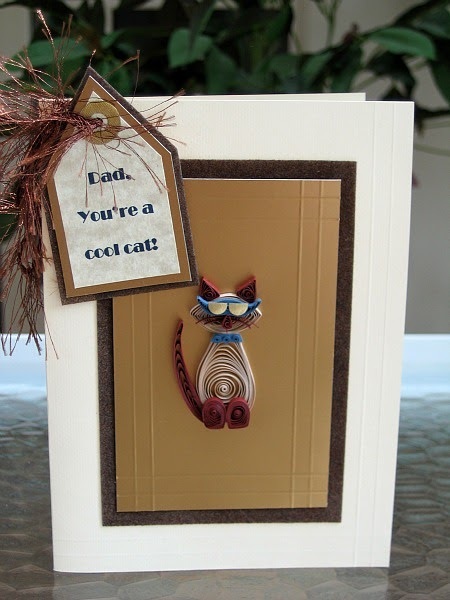 Oh your cat is so lovely, perfect for a father's card for sure...! I like how you can do complex character with simple quilling, you're so creativ... bravo ! This is adorable. I love his attitude ;) LOL! Is he a New Yorker? LOL! awsome, love the sunglasses, it gives the cat attitude!!! Hi! Love your quilling work!! This cat is adorable! I've watched the video quite a few times to try to help me with rolling my coils on the needle instead of the slot tool! It's difficult, but I just keep trying. I can't get my coils to be even when I need them to be!! Thanks for all the inspiration,especially for us beginners!! I'm lovin' so far!! I love the cat! So cute! 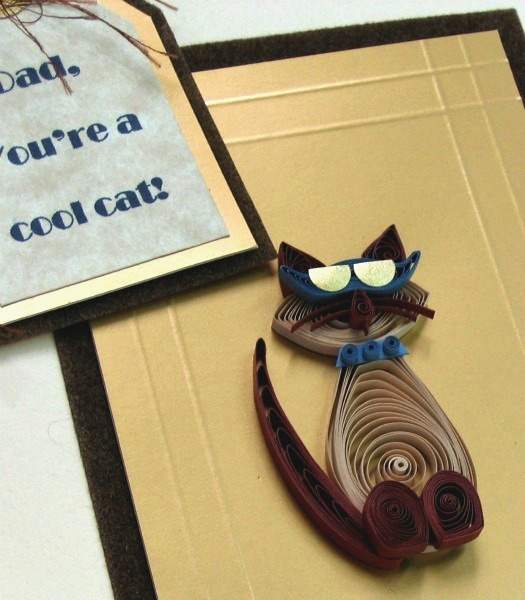 Love kitties, quilling, dad, and, your card! Great project!! Wonderful how you pointed out all the little detail touches that can turn a simple card into something so cooooool! what a cool cat that is!!!! Oh Ann, that is truly a cool cat! I love it. Cindee, aww I understand completely... I was frustrated with the needle tool in the beginning too, but it truly does become second nature with practice. Lissa, thanks and yes... it's the sum of the parts! Oooh, your blog has changed design. I haven't been active in the crafty blogosphere for a while - but I love your clean, light new look, Ann! Thanks Sonja - I'm glad you're back! How neat! 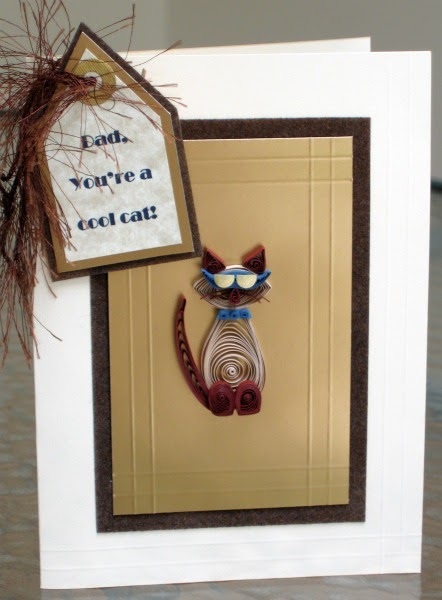 I love your quilled kitty!